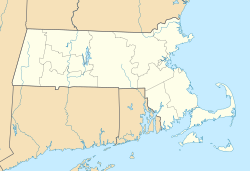 Quincy is a city in Norfolk County, Massachusetts, United States. Its nickname is "City of Presidents." As a major part of Metropolitan Boston, Quincy is a member of Boston's Inner Core Committee for the Metropolitan Area Planning Council (MAPC). Its population in 2010 was 92,271, making it the 8th largest city in the state. View of Mount Wollaston as it appeared in 1840, virtually unchanged from the time of initial English settlement in 1625. The central part of this sketch was adopted as the seal of Quincy. Prior to the settlement of the area by English colonists, a hill east of the mouth of the Neponset River near what is now called Squantum was the seat of the ruling Massachusett sachem, or native American leader, Chickatawbut. Called Moswetuset Hummock, it was visited by Plymouth Colony commander Myles Standish and Squanto, a native guide, in 1621. Four years later, a party led by Captain Wollaston established a post on a low hill near the south shore of Quincy Bay east of present-day Black's Creek. The settlers found the area suitable for farming, as Chickatawbut and his group, who used the name Passonagessit ("Little Neck of Land") for the area, had cleared much of the land of trees. This settlement was named Mount Wollaston in honor of the leader, who soon after 1625 left the area bound for Virginia. The Wollaston neighborhood in Quincy still retains Captain Wollaston's name. Upon the departure of Wollaston, Thomas Morton took over leadership of the post and the settlement proceeded to gain a reputation for debauchery with native women and drunkenness. Morton renamed the settlement Ma-re-Mount ("Hill by the Sea") and later wrote in reference to the conservative separatists of Plymouth Colony to the south who disapproved of his libertine practices that they were "threatening to make it a woefull mount and not a merry mount". In 1627 Morton was arrested by Standish for violating the code of conduct in a way harmful to the colony and was sent back to England, only to return and be arrested by Puritans the next year. The area of Quincy now called Merrymount is located on the site of the original English settlement of 1625 and takes its name from the punning name given by Morton. The area was first incorporated as part of Dorchester in 1630, and was briefly annexed by Boston in 1634. The area became Braintree in 1640, bordered along the coast of Massachusetts Bay by Dorchester to the north and Weymouth to the east. Beginning in 1708, the modern border of Quincy first took shape as the North Precinct of Braintree. Following the American Revolution, Quincy was officially incorporated as a separate town named for Col. John Quincy in 1792, and was made a city in 1888. In 1845 the Old Colony Railroad opened; the Massachusetts Historical Commission stated that the railroad was "the beginning of a trend toward suburbanization." Quincy became as accessible to Boston as was Charlestown. The first suburban land company, Bellevue Land Co., had been organized in northern Quincy in 1870. Quincy's population grew by over 50 percent during the 1920s. Among the city's several firsts was the Granite Railway, the first commercial railroad in the United States. It was constructed in 1826 to carry granite from a Quincy quarry to the Neponset River in Milton so that the stone could then be taken by boat to erect the Bunker Hill Monument in Charlestown, Massachusetts. Quincy granite became famous throughout the nation, and stonecutting became the city's principal economic activity. Quincy was also home to the first iron furnace in the United States, the John Winthrop, Jr. Iron Furnace Site (also known as Braintree Furnace), from 1644 to 1653. The Quincy Mine in Hancock, Michigan, founded in 1846, was named after Quincy because the mine started with significant investment from Massachusetts. In the 1870s, the city gave its name to the Quincy Method, an influential approach to education developed by Francis W. Parker while he served as Quincy's superintendent of schools. Parker, an early proponent of progressive education, put his ideas into practice in the city's underperforming schools; four years later, a state survey found that Quincy's students were excelling. Quincy was additionally important as a shipbuilding center. Sailing ships were built in Quincy for many years, including the only seven-masted schooner ever built, Thomas W. Lawson. The Fore River area became a shipbuilding center in the 1880s; founded by Thomas A. Watson, who became wealthy as assistant to Alexander Graham Bell in developing the telephone, many famous warships were built at the Fore River Shipyard. Amongs these were the aircraft carrier USS Lexington (CV-2); the battleships USS Massachusetts (BB-59), now preserved as a museum ship at Battleship Cove in Massachusetts, and USS Nevada (BB-36); and USS Salem (CA-139), the world's last all-gun heavy warship, which is still preserved at Fore River as the main exhibit of the United States Naval Shipbuilding Museum. John J. Kilroy, reputed originator of the famous Kilroy Was Here graffiti, was a welding inspector at Fore River. Quincy was also an aviation pioneer thanks to Dennison Field. Located in the Squantum section of town it was one of the world's first airports and was partially developed by Amelia Earhart. In 1910, it was the site of the Harvard Aero Meet, the second air show in America. It was later leased to the Navy for an airfield, and served as a reserve Squantum Naval Air Station into the 1950s. The Howard Johnson's and Dunkin' Donuts restaurant chains were both founded in Quincy. Celtic punk band Dropkick Murphys got its start in the city's Wollaston neighborhood in 1996. Quincy is also home to the United States' longest running Flag Day parade, a tradition that began in 1952 under Richard Koch, a former director of Parks and Recreation, who started the "Koch Club" sports organization for kids and had an annual parade with flags. Quincy shares borders with Boston to the north (separated by the Neponset River), Milton to the west, Randolph and Braintree to the south, and Weymouth (separated by the Fore River) and Hull (maritime border between Quincy Bay and Hingham Bay) to the east. Historically, before incorporation when it was called "Mount Wollaston" and later as the "North Precinct" of Braintree, Quincy roughly began at the Neponset River in the north and ended at the Fore River in the south. Quincy Bay, within city limits to the northeast, is part of Boston Harbor and Massachusetts Bay. There are several beaches in Quincy, including Wollaston Beach along Quincy Shore Drive. Located on the western shore of Quincy Bay, Wollaston Beach is the largest Boston Harbor beach. Quincy's territory includes Hangman Island, Moon Island (restricted access, and all land is owned by the City of Boston), Nut Island (now a peninsula), and Raccoon Island in the Boston Harbor Islands National Recreation Area. According to the United States Census Bureau, the city has a total area of 26.9 square miles (70 km2), of which 16.8 square miles (44 km2) is land and 10.1 square miles (26 km2) is water. The total area is 37.60% water. Although Quincy is primarily urban, 2,485 acres (3.9 sq mi; 10.1 km2) or fully 23 percent of its land area lies within the uninhabited Blue Hills Reservation, a state park managed by the Massachusetts Department of Conservation and Recreation. This undeveloped natural area encompasses the southwestern portion of Quincy and includes the city's highest point, 517 foot (158 m) Chickatawbut Hill. Other hills within Quincy include Forbes Hill in Wollaston, Presidents Hill in Quincy Center and Penns Hill in South Quincy. As of the 2010 United States Census, there were 92,271 people, 38,883 households, and 42,838 families residing in the city, making it the ninth largest city in the state. The population density was 5,567.9 people per square mile (2,025.4/km²). There were 42,838 housing units at an average density of 2,388.7 per square mile (922.5/km²). The racial makeup of the city was 65.5% White, 4.6% African American, 0.16% Native American, 24.0% Asian, 0.02% Pacific Islander, 0.85% from other races, and 1.76% from two or more races. Hispanic or Latino of any race were 4.6% of the population. 33.5% were of Irish (making Quincy the most Irish American city in the entire United States), 12.7% Italian and 5.0% English ancestry according to Census 2000. 77.1% spoke English, 8.0% Chinese or Mandarin, 2.6% Cantonese, 1.9% Spanish, 1.5% Vietnamese and 1.3% Italian as their first language. There were 38,883 households, out of which 20.7% had children under the age of 18 living with them, 38.7% were married couples living together, 10.5% had a female householder with no husband present, and 47.2% were non-families. 37.6% of all households were made up of individuals and 13.4% had someone living alone who was 65 years of age or older. The average household size was 2.22 and the average family size was 3.03. In the city the age distribution of the population shows 17.5% under the age of 18, 8.1% from 18 to 24, 36.1% from 25 to 44, 22.1% from 45 to 64, and 16.3% who were 65 years of age or older. The median age was 38 years. For every 100 females there were 91.0 males. For every 100 females age 18 and over, there were 88.5 males. The median income for a household in the city was $59,803, and the median income for a family was $77,514. Males had a median income of $51,925 versus $44,175 for females. The per capita income for the city was $32,786. About 7.3% of families and 9.8% of the population were below the poverty line, including 13.7% of those under age 18 and 10.1% of those age 65 or over. Quincy is divided into numerous neighborhoods with individual histories and characteristics. Adams Shore was originally developed as a summer resort location and is now a year-round residential area. Germantown was the site of a former planned manufacturing community begun in the 1750s to encourage German immigration and is now a residential neighborhood. Hough's Neck is a northeastern peninsular community named for Atherton Hough, who was granted the land in 1636 for use as a farm and orchard. Hough's Neck has a substantial Irish American population. Marina Bay is a residential-commercial area developed in the 1980s on the site of the closed Naval Air Station Squantum with high-rise condominiums, restaurants and a large marina. Merrymount is a primarily residential neighborhood and the site of Quincy's initial settlement. Montclair is the northwestern section of the city along West Squantum Street, bordering the town of Milton. North Quincy is a residential and commercial neighborhood along Hancock Street and Quincy Shore Drive that includes a substantial Asian population with substantial Asian business growth. Quincy Center is the commercial and government center of the city where City Hall, Thomas Crane Public Library, the Old Stone Church, Quincy Masonic Building, and numerous office buildings and residential streets can be found. Quincy Point is a densely populated residential area east of Quincy Center, with commercial areas along Quincy Avenue and Southern Artery, that is also the site of the Fore River Shipyard. South Quincy is a residential area bordering the town of Braintree that includes Crown Colony office park and Faxon Park, a wooded 66-acre (0.267 km2) protected space. Squantum in the peninsular northernmost part of Quincy grew from being a summer resort adjacent to an early civilian, then military airfield into a year-round residential neighborhood. Squantum boasts one of the largest Irish American populations, per capita, in the United States. West Quincy is a residential and commercial section with immediate access to Interstate 93 and the site of several former granite quarries, now the Quincy Quarries Reservation, and the Granite Railway, first commercial railway in the United States. Wollaston, named for Captain Richard Wollaston, the leader of Quincy's original settlers, was an early rail-accessed commuter home for Boston workers that is now a densely populated residential and commercial area and site of Eastern Nazarene College. During its history Quincy has been known as a manufacturing and heavy industry center, with granite quarrying dominating employment in the 19th century and shipbuilding at Fore River Shipyard and Squantum Victory Yard rising to prominence in the 20th century. The recent decades have seen a shift in focus to several large employers in the financial services, insurance and health care sectors of the economy. Quincy is the location of the corporate headquarters of several firms, including Boston Financial Data Services, the Stop & Shop supermarket chain, Arbella Mutual Insurance Company and The Patriot Ledger, publisher the South Shore's largest regional newspaper. Other major employers with offices in Quincy are State Street Corporation, Blue Cross Blue Shield, Harvard Pilgrim Health Care and Boston Scientific. TACV, national flag carrier airline of Cape Verde, has its United States corporate office in Quincy. The Quincy office serves residents of Connecticut, Massachusetts, and Rhode Island. Quincy is home to various educational institutions, public and private, including one early childhood education center, one Montessori school, one Catholic school, one college preparatory school, one college of liberal arts and sciences (Eastern Nazarene College), one community college (Quincy College), two public high schools, five public middle schools, and 12 public elementary schools. In the 19th century, the city became an innovator in progressive public education with the Quincy Method, developed by Francis W. Parker while he served as Quincy's superintendent of schools. Four years after its implementation, a state survey found that Quincy students excelled at reading, writing, and spelling, and ranked fourth in their county in math. The city is home to Eastern Nazarene College, a college of the liberal arts and sciences located in Wollaston Park. The college relocated to the area in 1919 from its original location in Saratoga Springs, New York, where it was established as a holiness college in 1900. Quincy College, a community college in Quincy Center, operates under the auspices of the City of Quincy. The college is unusual in this respect, as it is the only one of Massachusetts' 16 community colleges to be run by a city rather than by the state. It is one of only two colleges in the United States organized this way. Public education at the primary and secondary levels is managed by Quincy Public Schools, a system that includes one early childhood center, eleven elementary schools, five middle schools and two high schools. For a number of years, the Fore River Apprentice School was operated at the Fore River Shipyard to teach its students how to work in the shipyard. Because Quincy is part of Metro Boston, it has easy access to transportation facilities. State highways and the Interstate system connect the Greater Boston area to the airport, port, and intermodal facilities of Boston. Due to its proximity to Boston proper, Quincy is connected not only by these modes of transportation but also to the regional subway system, operated by the Massachusetts Bay Transportation Authority (MBTA), known locally as "The T". The four subway or "T" stops in Quincy, which are on the MBTA's Red Line, are North Quincy Station, Wollaston Station, Quincy Center Station, and Quincy Adams Station. Interstate 93 and U.S. Route 1 travel south to north concurrently through Quincy beginning in the southwest, where the Quincy–Randolph border bisects the median between the northern and southern halves of the Exit 5 cloverleaf at Massachusetts Route 28. Following a route around the southern extent of the Blue Hills Reservation, this I-93 and US 1 alignment is along the former southern section of Route 128. The highway travels along a wooded wetland region of the Reservation, entering Quincy completely just beyond Exit 5 and then crossing into Braintree as it approaches the Braintree Split, the junction with Massachusetts Route 3. Weekday traffic volume averages 250,000 to 275,000 vehicles per day at this intersection, the gateway from Boston and its inner core to the South Shore and Cape Cod. As Route 3 joins I-93 and US 1 at the Braintree Split, the three travel north together toward Boston around the eastern extent of the Blue Hills Reservation, entering West Quincy as the Southeast Expressway. The expressway provides access to West Quincy at Exit 8 – Furnace Brook Parkway and Exit 9 – Bryant Avenue/Adams Street before entering Milton. The Furnace Brook Parkway exit also provides access to Ricciuti Drive and the Quincy Quarries Reservation as well as the eastern entrance to the Blue Hills Reservation Parkways. Principal numbered state highways traveling within Quincy include: Route 3A south to north from Weymouth via Washington Street, Southern Artery, Merrymount Parkway and Hancock Street to the Neponset River Bridge and the Dorchester section of Boston; Route 28, which travels south to north from Randolph to Milton along Randolph Avenue in Quincy through a remote section of the Blue Hills Reservation; and Route 53, which enters traveling south to north from Braintree as Quincy Avenue, turning right to form the beginning of Southern Artery in Quincy Point before ending at the intersection with Washington Street/Route 3A. Quincy Center as seen from the intersection of Adams Street and Hancock Street. In addition to the Blue Hills parkways, Quincy includes two other Massachusetts Department of Conservation and Recreation parkways. Furnace Brook Parkway travels east from I-93 through the center of the city from West Quincy to Quincy Center and Merrymount at Quincy Bay. There the parkway meets Quincy Shore Drive at the mouth of Blacks Creek. Quincy Shore Drive travels in a northerly direction along the shore of Quincy Bay through Wollaston and into North Quincy, with much of its length abutting Wollaston Beach, then turns in a westerly direction upon intersecting with East Squantum Street and continues to meet Hancock Street at the Neponset River Bridge. As for Quincy's other important city streets, Hancock Street begins at the southern extent of Quincy Center and travels north to Dorchester as a main commercial thoroughfare of Quincy Center, Wollaston and North Quincy. Washington Street enters the city at Fore River Rotary after crossing Weymouth Fore River and continues to Quincy Center, ending at Hancock Street. Along with Quincy Avenue and Southern Artery, other heavily traveled streets include Newport Avenue, which parallels Hancock Street to the west on the opposite side of the MBTA railway, Adams Street heading west from Quincy Center to Milton, and West and East Squantum Streets in the Montclair and North Quincy neighborhoods. Other streets are discussed in several of the neighborhood articles listed above. Boston's Logan International Airport is accessible via MBTA Red Line connections at South Station, directly on the MBTA commuter boat (see below) or by motor vehicle using Interstate 93 or surface roads to the Ted Williams Tunnel. Subway service is available on the Red Line of the MBTA from four stations in Quincy: North Quincy, Wollaston, Quincy Center, and Quincy Adams. Commuter rail service operates out of Quincy Center. Both services serve South Station in Boston with connections to MBTA Commuter Rail and Amtrak intercity lines. Buses are also available for transportation in Quincy, including private bus lines and several lines provided by the MBTA. Most of the MBTA routes funnel through the Quincy Center station, which is the principal hub south of Boston for all MBTA bus lines. The southern bus garage for the MBTA system is adjacent to the Quincy Armory on Hancock Street. Quincy is a major terminal for the commuter boat system that crosses Boston Harbor to Long Wharf, Hull, Rowe's Wharf, Hingham, and Logan Airport. The commuter boats, operated by Harbor Express under license by the Massachusetts Bay Transportation Authority, dock at the Fore River Shipyard in Quincy Point. Quincy has had brief flirtations with professional sports. The Quincy Chiefs of the minor league Eastern Basketball Association (the predecessor to the current Continental Basketball Association) played a single season in 1977-78, and was coached and managed by current Boston Celtics executive Leo Papile. The Chiefs finished 12-19 in third place, and lost in the playoffs to eventual league champion Wilkes-Barre. Quincy's professional baseball team, the Shipbuilders, competed in the New England League in 1933, recording a 12-6 record before moving to Nashua midseason. The final season of the Boston Minutemen of the North American Soccer League was played at Veterans Memorial Stadium in Quincy, in 1976, finishing 7-17. The Quincy Militia, a minor league football team, played its inaugural season in the Eastern Football League in 2009. Quincy has had several entries in the EFL over the years and fell in the title game of the 2009 in OT after it seemed they had won on a 34 yard field goal at the end of regulation. http://www.patriotledger.com/sports/x320082915/Militia-fall-in-EFL-title-game-as-official-s-call-nullifies-a-would-be-victory Games are played July - October with home games at Veterans Memorial Stadium on Saturday nights. Quincy's only college sports program is the "Lions" of Eastern Nazarene College, in the DIII Commonwealth Coast Conference of the National Collegiate Athletics Association (NCAA) and the Eastern College Athletic Conference (ECAC). Games are played at Bradley Field and the Lahue Physical Education Center on-campus, or at Adams and Veterans Memorial Fields in Quincy. Quincy's high school sports programs are in the Patriot League: the DIII Fisher Division "Red Raiders" of North Quincy High School and the DIIA Keenan Division "Presidents" of Quincy High School, who are rivals. Quincy also hosted the youth baseball Babe Ruth League World Series in 2003, 2005 and 2008. High school baseball and Babe Ruth League games are played at Adams Field. High school football is played at Veterans Memorial Field. John F. Keenan - Massachusetts State Senator from the Norfolk and Plymouth district. Listen to Adams' name. (help·info) The name Quincy has subsequently been used for at least nineteen other places in the United States. Those places were either directly or indirectly named for John Quincy Adams (for example, Quincy, Illinois was named in honor of Adams while Quincy, California was named for Quincy, Illinois). However, they are all pronounced /ˈkwɪnsi/ KWIN-zee. "Peacefield", residence of four generations of the Adams family. The Josiah Quincy House in Wollaston Park. Tombs of Presidents John Adams and John Quincy Adams and their wives, in a family crypt beneath the United First Parish Church in Quincy Center. Quincy Quarries Reservation in West Quincy. View of Marina Bay and Boston across Quincy Bay from Wollaston Beach. USS Salem (CA-139), site of the United States Naval Shipbuilding Museum. ^ a b "Population and Housing Occupancy Status: 2010 - State -- County Subdivision, 2010 Census Redistricting Data (Public Law 94-171) Summary File". U.S. Census Bureau. http://factfinder2.census.gov/faces/tableservices/jsf/pages/productview.xhtml?pid=DEC_10_PL_GCTPL2.ST16&prodType=table. Retrieved 2011-03-23. ^ Herring, James; Longacre, James Barton (1853). The National Portrait Gallery of Distinguished Americans. D. Rice & A.N. Hart. p. 1. http://books.google.com/books?id=gVMYAAAAIAAJ&pg=PT50&dq=%22mount+wollaston%22#PPT50,M1. Retrieved 2008-10-22. ^ "Frequently Asked Questions". City of Quincy. http://www.quincyma.gov/Utilities/faq.cfm#13. Retrieved 2009-07-09. ; Wead, Doug (2005). The raising of a president: the mothers and fathers of our nation's leaders. New York: Atria Books. p. 59. ISBN 0-7434-9726-0. OCLC 57358429. http://books.google.com/books?id=BI22SihvFJwC&pg=PA59. Retrieved 2009-07-09. ^ "East Squantum Street (Moswetuset Hummock)". Quincy, Massa. Historical and Architectural Survey. Thomas Crane Public Library. 1986. http://thomascranelibrary.org/htm/436.htm. Retrieved 2009-06-24. ^ Neal, Daniel (1747). "XIV: The Present State of New England". The history of New-England. 2 (2 ed.). London: Printed for A. Ward. p. 216. OCLC 8616817. http://books.google.com/books?id=u3opAAAAYAAJ&pg=PA216. Retrieved 2009-06-24. ^ Schoenberg, Thomas J. (2006). "Morton, Thomas - Introduction.". Literary Criticism (1400-1800). enotes.com. http://www.enotes.com/literary-criticism/morton-thomas. Retrieved 2009-10-15. ^ a b c Lodge, Henry Cabot (1902). Boston. New York: Longmans, Green, and Co.. p. 7. OCLC 4276118. http://books.google.com/books?id=PnFx61kbyxsC&pg=PA7. Retrieved 2009-10-15. ^ Morton, Thomas (1883). Charles Francis Adams, Jr.. ed. The new English Canaan of Thomas Morton. Boston: The Prince Society. p. 278. OCLC 28272732. http://books.google.com/books?id=W1-m0r-Nsi4C&pg=PA278. Retrieved 2009-10-15. ^ "The Merrymount Association". http://www.merrymountquincy.com/. Retrieved 2009-10-15. ^ Adams, Charles Francis (1891). History of Braintree, Massachusetts (1639-1708) : the north precinct of Braintree (1708-1792) and the town of Quincy (1792-1889). Cambridge, Massachusetts: Riverside Press. pp. 3–5. http://www.archive.org/details/historyofbraintr00adam. ^ a b Pattee, William S. (1859). A History of Old Braintree and Quincy: With a Sketch of Randolph and Holbrook. Green & Prescott. p. 12. http://books.google.com/books?id=N3gdM3L6dIMC&pg=PA12. ^ Taylor, Earl (2008). "Dorchester MA, Town History 1630-1870". Dorchester Atheneum. http://www.dorchesteratheneum.org/page.php?id=52. Retrieved 2009-10-15. ^ "A Short History Lesson (from the Town's Master Plan)". Town of Weymouth. http://www.weymouth.ma.us/history/index.asp. Retrieved 2009-10-15. ^ Pattee, William S. (1859). A History of Old Braintree and Quincy: With a Sketch of Randolph and Holbrook. Green & Prescott. p. 61. http://books.google.com/books?id=N3gdM3L6dIMC&pg=PA61. ^ "Good Neighbor Booklet". City of Quincy. Date unknown. pp. 20. http://www.quincyma.gov/CityOfQuincy_Content/documents/FinalBooklet.pdf. Retrieved 2010-01-16. ^ "MHC Reconnaissance Survey Town Report QUINCY." Massachusetts Historical Commission. 1981. 9 (10/18). Retrieved on January 16, 2010. ^ Osgood, Charles (2001). Kilroy Was Here: The Best American Humor From World War II. New York: Hyperion. p. 19. ISBN 978-0-7868-6661-8. OCLC 45532422. http://books.google.com/books?id=VzeUInvfBF4C&pg=PA19. Retrieved 2009-07-29. ^ Conkley, D. "Flag Day is a banner day in Quincy". Retrieved 2008-06-12. ^ Average weather for Quincy Weather Channel'.' Retrieved March 29, 2008. ^ "Quincy (city) QuickFacts from the US Census Bureau". http://quickfacts.census.gov/qfd/states/25/2555745.html. Retrieved Nov 30, 2011. ^ Jabaily, Robert (Fall 2007). "Coping with Economic Change: Quincy, Massachusetts". The Ledger. Retrieved on 2009-11-14. ^ "Contact Us." Boston Financial Data Services. Retrieved on October 23, 2009. ^ Reidy, Chris. "Quincy, Massachusetts-Based Grocery Chain to Take Over 75 New York, New Jersey Stores." The Boston Globe. May 24, 2000. Retrieved on October 23, 2009. ^ a b c "Major Employers." Quincy 2000 Collaborative. Retrieved on October 23, 2009. ^ "Here's who we are and how you can reach us." The Patriot Ledger. Retrieved on October 23, 2009. ^ "Office Locations." State Street Corporation. Retrieved on October 23, 2009. ^ Archambeault, Bill. "Blue Cross to merge offices, build in Quincy." Boston Business Journal. Friday October 17, 2003. Retrieved on October 23, 2009. ^ "Contact." TACV Cabo Verde. Retrieved on October 23, 2009. ^ "TACV Cabo Verde Opens Additional Sales and Ticketing Offices in U.S." Travel World News. July 16, 2009. Retrieved on October 23, 2009. ^ Viser, Matt (2006-12-23). "Menino targeting community colleges". The Boston Globe. http://www.boston.com/news/local/articles/2006/12/23/menino_targeting_community_colleges/. ^ Donald B. Gratz, "The road not taken: The evolution of a municipal junior college" (January 1, 1998). Boston College Dissertations and Theses. Paper AAI9828009. ^ "Our Schools". Quincy Public Schools. http://www.quincypublicschools.com/schools/schools_mainpage.shtml. Retrieved 25 December 2010. ^ "Three Parochial Elementary Schools To Merge To Form Quincy Catholic Academy". The Quincy Sun. January 21, 2010. ^ Rines, Lawrence S.; Sarcone, Anthony F.. "A History of Shipbuilding at Fore River". Thomas Crane Public Library. http://www.forerivershipyard.com/historylong.php. Retrieved 24 December 2013. ^ "I-93/Southeast Expressway/Route 3 (Braintree Split): Operational Assessment and Potential Improvements" Boston Region Metropolitan Planning Organization, March 2006, p. 3. ^ McHugh, Patrick (August 20, 2009). "Semi-pro Quincy football team is not playing like an EFL expansion team". Quincy, Massachusetts: The Patriot Ledger. http://www.patriotledger.com/sports/x387871853/Semi-pro-Quincy-football-team-is-not-playing-like-an-EFL-expansion-team. Retrieved 28 November 2009. ^ Crowe, Julia (2012). My First Guitar: Tales of True Love and Lost Chords from 70 Legendary Musicians. ECW Press. pp. 92–93. ISBN 1770902759. http://books.google.com/books?id=vivVZObwWTYC&pg=PA92. This page uses content from the English language Wikipedia. The original content was at Quincy, Massachusetts. The list of authors can be seen in the page history. As with this Familypedia wiki, the content of Wikipedia is available under the Creative Commons License.